The summer urban heat island (UHI) effect is a daytime elevation in the outdoor urban air temperature that results in part from the replacement of trees and other vegetation with buildings, roads and other heat-absorbing infrastructure. Urban surface properties. Roofs and pavements can constitute about 60% of the surface area of a U.S. city. These surfaces are typically dark in color and thus absorb at least 80% of sunlight, causing them to get warmer than lighter colored surfaces.1 These warm roofs and pavements then emit heat and make the outside air warmer. 1 Akbari H, Menon S, Rosenfeld A. 2009. 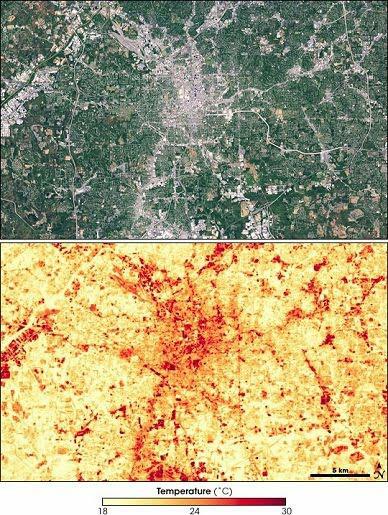 Global cooling: increasing world-wide urban albedos to offset CO2. Climatic Change, 94 (3-4), 275-286. Akbari, Hashem, and Arthur H Rosenfeld. "Cool communities." Macmillan Encyclopedia of Energy 1 (2000) 305-8. LBL-44129. Rosenfeld, Arthur H, Hashem Akbari, Joseph J Romm, and Melvin Pomerantz. "Cool communities: strategies for heat island mitigation and smog reduction." Energy and Buildings 28 (1998) 51-62. Akbari, Hashem, and Sarah E Bretz. "Cool systems for hot cities." Professional Roofing 32-35 (1998) 1-5. LBL-43814. Rosenfeld, Arthur H, Joseph J Romm, Hashem Akbari, Melvin Pomerantz, and Haider Taha. "Policies to reduce heat islands: Magnitudes of benefits and incentives to achieve them." 1996 ACEEE Summer Study on Energy Efficiency in Buildings. 18th ed. Vol. 9. Asilomar Conference Grounds, Pacific Grove, CA, 1996. 177-186. LBL-38679. Huang, Yu Joe, Susan Davis, and Hashem Akbari. "A guidebook for the control of summer heat islands." 1990 ACEEE Summer Study on Energy Efficiency in Buildings 1990: 79-85. LBL-29224.